It really frustrates me in scary movies when people start wandering off by themselves and one by one the killer takes them out. “Lets split up…you go that way and I will check this way.” Idiots!! They die EVERY TIME. That really does frustrate me, but I am going somewhere with this example…I promise. Every Friday morning I meet with a group of guys and we do life together. We have conversations on things we are struggling with in life. We celebrate the good things happening in our lives. We pray. It can sometimes get awkward…we call each other out…but it is all out of love for one another. We want the best for each other because we care. Unlike in these scary movies, we know that if we went off on our own we would die or if we let someone wander off on their own they would die. We stick together, we grow together, and we do life together. …but the word together does not solve all problems. You can all board the same train…together…but if that train is headed in the wrong direction you will all go down…together. In other words, make sure these guys or girls you decide to do life with are headed in the direction you want to go. If they are not it still might feel safe because you are with other people, but in reality you will be getting further away from where God wants you to be. Sin is sneaky. It makes you feel happy and comfortable and when you finally realize where you are…you wake up to a long train ride home. If our Friday morning group was a scary movie…bear with me here…and one of our members tried to go off on his own…we would not let him! In life we tend to wander and we go through seasons in our faith. One week we are fired up…another week we are struggling. If you have people around you that are encouraging you and lifting you up that is huge! Everyone needs help in life and God did not design us to attempt to live life alone. Everyone has heard Proverbs 27:17, “As iron sharpens iron, so one person sharpens another.” Let’s live that verse out! Are you part of a community group, small group, or bible study? If you are not and you live in the Greenville area please reach out to us. We have people involved in several local churches and ministries that offer groups for girls and guys of all ages. Wherever you are in life we can find a group for you. Parents – if you have a group of high school students who need a leader we can provide that for you. We are really serious about this offer. We know there are people out there searching for community and searching for a solid group of people to do life with. 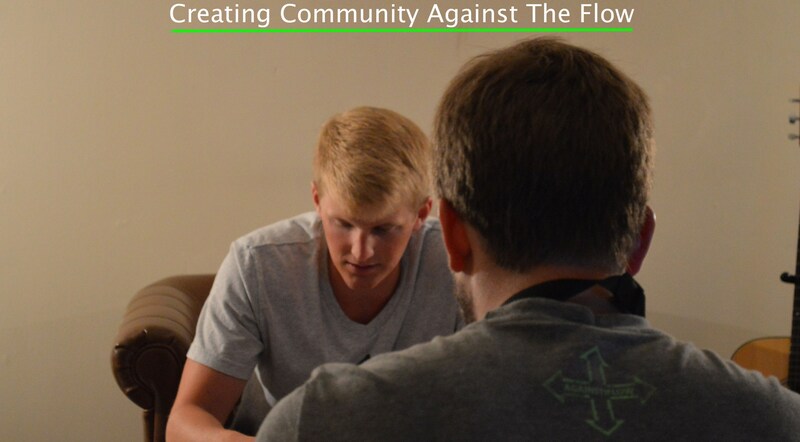 Our tagline “Creating Community Against The Flow” is not a joke. We believe that God put us on this earth to help each other and His word is the way, the truth, and the life.